What is Morphogenic Field Technique® (MFT)? VIDEO MFT w/ Dr. Springob, D.C.
MFT is a structured system by which a skilled Health Care Practitioner can develop an accurate individualized dietary and nutritional protocol within 3-5 minutes using the quantum physics concept of energy signatures. With 36 years of clinical observation and experience, Dr. Frank Springob co-developed Morphogenic Field Technique® (MFT) based upon the inspired thinking of Certified Nutritional Therapist, Autumn Smith, NTP. The Morphogenic Field is a term we use to describe the field of energy around the body. It is an extension of the electrical energy of the nervous system. Just as all electrical systems have electro-magnetic fields that surround them, the brain is an electrical generator with its own field of energy that extends away from the physical body. Many cultures and disciplines recognize this field and give it other names. When people discuss auras, chakras, life force or chi, they are possibly talking about this same energy field. They choose that name for this nutritional and energetic healing technique for a number of reasons. The word can be broken down into “morph”, meaning “to change” and “genic” meaning ‘to originate”. This is the exact goal in dealing with any health issue—to use these energy fields to “originate change” in the patient’s health status. This is accomplished by supplying the nutrients needed to feed the body at the cellular level. The name is similar to the word “morphogenetic” as discussed in Dr. Royal Lee’s groundbreaking manual, “An Introduction to Protomorphology”. Dr. Lee described the protomorphogen (PMG) as “that component of the cell chromosome that is responsible for morphogenetic determination of cell characteristics. It is the smallest unit of the cell blueprint assembly.” Protomorphology is an important component of Morphogenic Field Technique (MFT). In our procedure, we rely heavily on information from the energy field of the cell to guide us in developing nutrtional protocols for the individual patient. These energies represented both “normal energies” and “abnormal energies”. This was done in an attempt to “ramp-up” or “amplify” the energy required to communicate with the M-Field. Cellular communication is the ultimate goal. When we address the exact nutritional needs at the cell level, we affect the greatest change in health. After all, healthy cells are required for healthy tissues. Healthy tissues are required for healthy organs. Healthy organs should then result in a healthy organism. What does it mean to match the energy signature of your body to the energy signature of your food? The science of quantum physics exists to explain the phenomena of the smallest pieces of structure known to man. At the core of all structure is energy. The human body consists of many “systems” of physiological function such as the digestive system, the nervous system, the circulatory system, etc. Each of these systems is made up of organs. Organs are made up of tissues, which are made up of cells. If you go even smaller, you discover molecules, atoms and sub-atomic particles, which are comprised of packets of energy wholeness known as the “quantum”. Each level of matter and each level of life has an “energy signature” that is unique. Your personal energy signature is the sum of all of the trillions of energy signatures that go into your makeup. Your energy signature is greatly influenced by your immediate environment—what you eat, your level of emotional stress, toxins that have entered your system and hundreds of other factors including your genetic make-up. In other words, your energy signature today is different from what it was last year, last week and even yesterday. It varies based upon your diet, sleep, stress and toxic exposure. 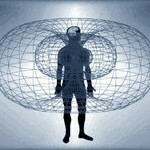 Your energy is represented by a field that constantly surrounds your body in a recognizable pattern call the “torus”. In our work, we call this the Morphogenic Field or M-Field. In a healthy person, it is a large and balanced field that radiates off the body to approximately 5-7 feet, based upon the MFT method of measurement. People with a large M-field are usually healthy, vibrant individuals. People with a small or distorted M-Field usually have some level of health challenge and are lacking in personal energy. This torus pattern is found consistently in all scales of matter, from the atom to humans, to planets and even galaxies. Food also has an energy signature. 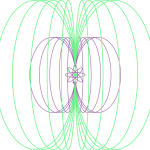 The same torus pattern can be seen in the cross section of an apple or an orange. In MFT, we consider the torus to represent the energy signature of the atom, the fruit, the human or the planet. We use this, in combination with the science of muscle response testing, to match-up the energy signature of food with the energy signature of the person. The food is presented to a person’s energy field with the intention of learning whether or not the food is an M-Field Signature Match to that person. If it matches, the food can be considered acceptable to that person. It the body rejects the food, we conclude that this food will not provide the body with the nutrients that it needs at that given time. We contend that “matched food” is nourishing to the body and “mismatched food” is a hindrance to that person’s health and well-being. Our purpose in presenting this concept is to educate and empower people to seek food sources that will expand their M-Field and thus become healthier and more vibrant. If consumers seek food that nourishes and fuels the body, it goes a long way toward developing a supply-and-demand situation where the people who grow our food will move away from their current trend of degrading our food supply with processed and genetically engineered products. M-Field Signature Matching consistently reveals that only the energy of organic whole food truly matches the energy signature of the body. Our long-term experience in a wide variety of cases tells us the first thing we must determine is whether or not you are a “MFT Case.” If someone is NOT a “MFT Case” then it is unlikely that MFT will ever help you. However, if you ARE a “MFT”, then in our experience, it is our belief that nothing else will help you as much. Does the above describe your situation? Then you’ve come to the right place! Call our Fair Oaks chiropractic office to find out more! Your chances of recovery have never been higher! Most programs include dietary suggestions (as well as whole food supplements) to aid your body in healing itself. Concentrated whole food and/or herbal supplements are used. These have been prepared by a unique process that preserves all of the active enzymes and vital components. After we identify the underlying reason your body is creating symptoms, we can isolate and verify the precise whole food supplements (and quantities) your body needs to resolve it’s problems. Our goal is to have you take as few supplements as possible, with your body being fully addressed and restored at the same time. If testing indicated a vitamin A deficiency, we would look for a whole food high in vitamin A complex (and carrots would be a likely source). A supplements rich in this complex would then be included in your program. We pride ourselves on only using the highest quality whole food supplements available. Now in incredibly concentrated form, your body can get complete nutrition from this small tablet! By restoring the nutrition on which your body was founded, it is possible to enable your body to heal itself . . . just as Nature intended. Each case is handles on an individual basis. The majority of patients who adhere to their programs have reported noticing positive changes in the first 4 to 6 weeks (some longer, and some sooner). Your improvement is directly proportional to the adherence to your program. Through the course of your program additional layers will show up. For example, if you have a long term health problem you may find that your body may (or may not) want to address this first. Your body will dictate its priority each time you are tested. We eat plenty, but we are still starving. The foods we eat are not providing our bodies with the nutrition they need to survive and be healthy. We are starving our bodies and we are sick. We suffer from diabetes, heart attacks, obesity, and the list goes on and on. Given proper nutrition, the human body has an amazing ability of keeping itself healthy. If properly fed and given the right nutrients, the human body is designed to repair itself. To do so, we need to eat a healthier diet, exercise, and take high-quality supplements made from whole foods. Whole food supplements supply our bodies with then nutrients we are not getting from our diet – all the vitamins, minerals, trace minerals, and phyto-nutrients that foods possess – in the way that nature intended, in a whole food form. Whole food supplements are made by concentrating foods. When concentrated correctly, the foods supply a multitude of nutrients. These nutrients work synergistically, meaning they work together, to provide you with optimal nutrition for good health. A word of advice: Not all whole food supplements are the same. Many whole food supplements available in today’s marketplace range in quality. Companies are riding the wave of supplement popularity rather than focusing on commitment and quality. At LeMay Chiropractic, we believe that given the proper nutrition, your body has the amazing capability of keeping itself healthy. We also believe that nutrition should be individualized to meet each patient’s needs. We look forward to assisting you with your goal for improved health. Feel free to call our Fair Oaks chiropractic office or email us any questions. Or better yet, make an appointment for your own personalized Nutrition Response Testing evaluation by selecting the Make an Appointment button at the top of the page. Interested in getting started? Contact LeMay Chiropractic & Wellness today to make your appointment!